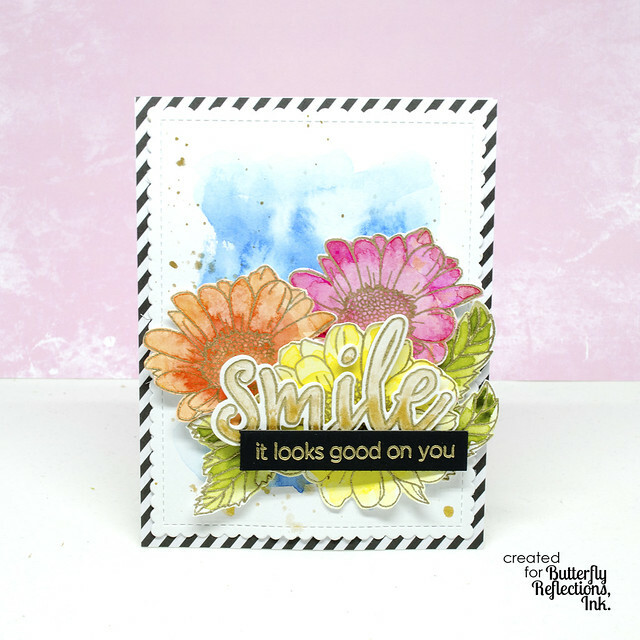 I started off by stamping the daisies from one of the recent Altenew releases: Spring Daisy. I stamped it with VersaMark ink and heat embossed with gold embossing powder. I fussy cut them and added loose watercolors. For the background, I used a striped black and white pattern paper Let's Polka in the Meadow and trimmed it down to size A2 (4.25" x 5.5") and added it to my white cardbase. I die-cut watercolor paper with the frame die from MFT Stamps' Die-namics Blueprints #27. I added blue watercolors and then splattered with gold watercolors from Gansai Tambi Starry Colors (sooo pretty!). Once it was dry, I glued it over the pattern paper. 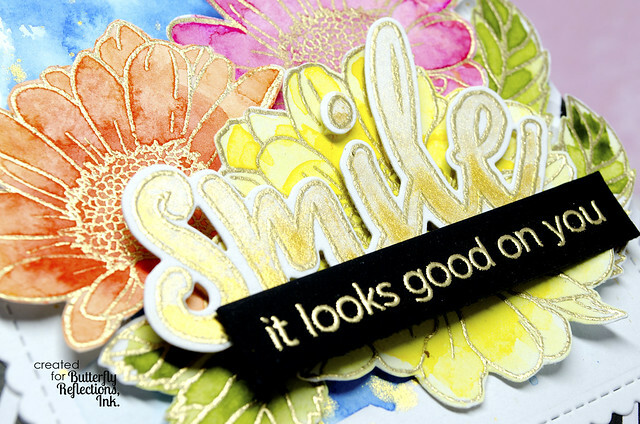 Separately, I stamped the smile outline word from Halftone Smile with VersaMark ink and heat embossed with gold embossing powder. 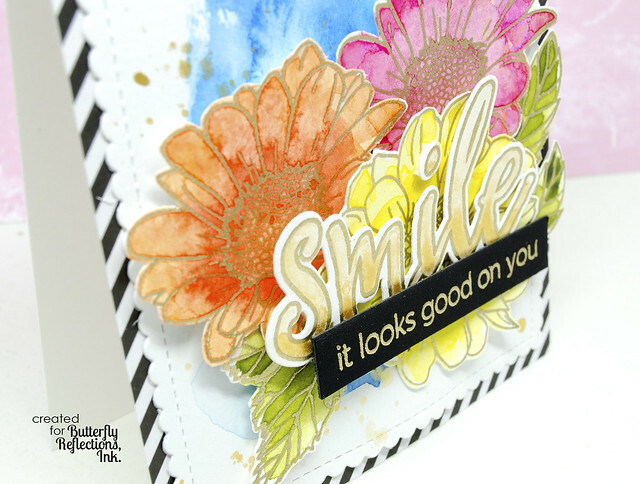 I die-cut using the coordinating Smile die. Using the Gansai Tambi Starry Colors from earlier, I added touch of gold watercolors and went for an ombre look. I stamped 'it looks good on you' on black cardstock with VersaMark ink again and heat embossed with the same gold embossing powder. I trimmed it down. To finish it off, I arranged all the images and sentiments over the card base with foam tape. I hope you enjoyed today's card! Don't forget, Butterfly Reflections Ink has a 25% off sale going on until tomorrow night! No code needed! Some exclusions apply. Check IG or Facebook for more details. :) Have a great weekend! You rocked it again Ruby! ;) absolutely stunning card! Gorgeous, love the color of the flowers they're perfect. The striped background and gold really makes everything pop. Thanks for sharing and inspiring. You go girl love it.